Areas of extension are afﬁliated with horizontal divergent stress and are found in association with constructive or passive plate boundaries and in intra-plate settings. Thus, extensional stress regimes either are associated with subsidence and basin formation (in intra-plate settings) or characterise active break-up of continents (along constructive or passive margins). Although the conditions for development of petroleum systems in areas of active spreading may be meagre, the remnants of the earlier stages of break-up, now situated in passive margins settings, fulﬁl all the requirements that characterise productive petroleum provinces. This is because such tectonic regimes have undergone crustal thinning and associated subsidence, which involves all the processes essential for petroleum to be generated, trapped and accumulated in sufﬁcient volumes and concentrations for petroleum ﬁelds to be commercially interesting. Accordingly,such settings frequently display an attractive combination and distribution of source, reservoir and cap rocks, structural and stratigraphic traps and the conditions for maturation, expulsion, migration and accumulation of hydrocarbons. 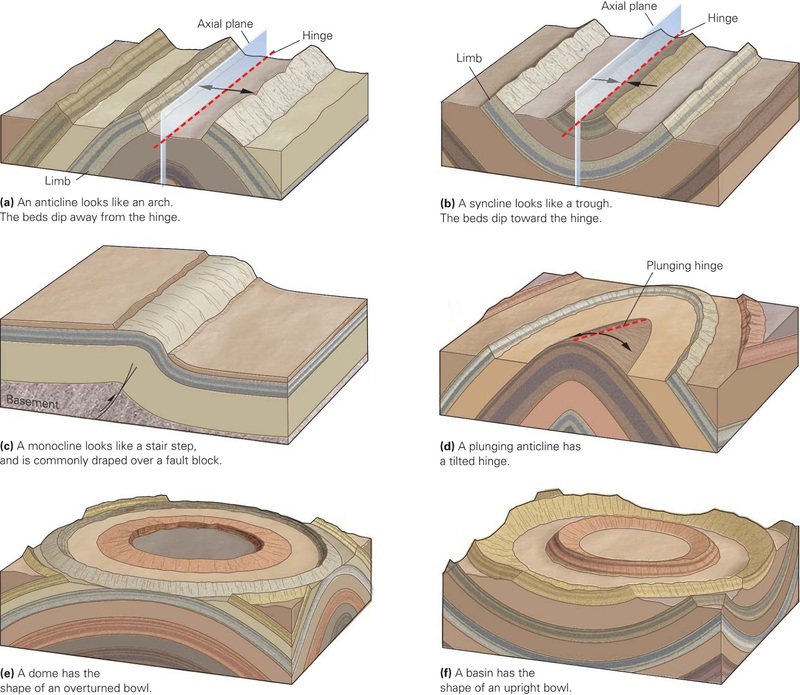 The formation of extensional basins may be seen as the ﬁrst stage of the Wilson Cycle, which begins with thinning, stretching and rifting of the continental crust followed by continental break-up and mid-oceanic spreading. 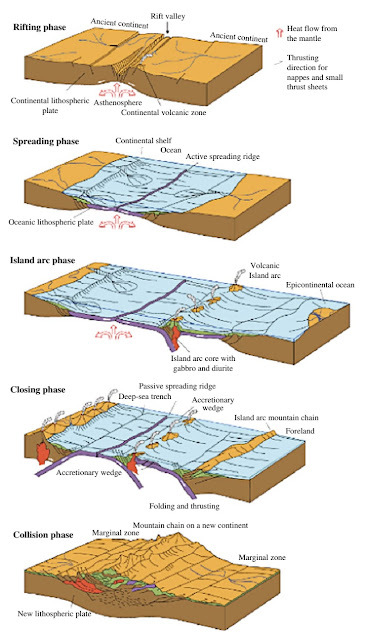 The concept of the Wilson cycle predicts that this process sometimes becomes reversed, causing closure of the ocean, collision between the adjacent continental plates, and hence the construction of a mountain chain along the zone of collision. The junction between the continental plates deﬁnes the suture between the two. The major stages in the Wilson Cycle. If we use the present North Atlantic as one example, the highly hydrocarbon-rich northern North Sea basin system is situated in a passive continental margin conﬁguration, where the extensional basin system developed during continental break-up. In contrast, Iceland, where petroleum resources are less abundant, is situated on the top of the mid-oceanic spreading ridge. 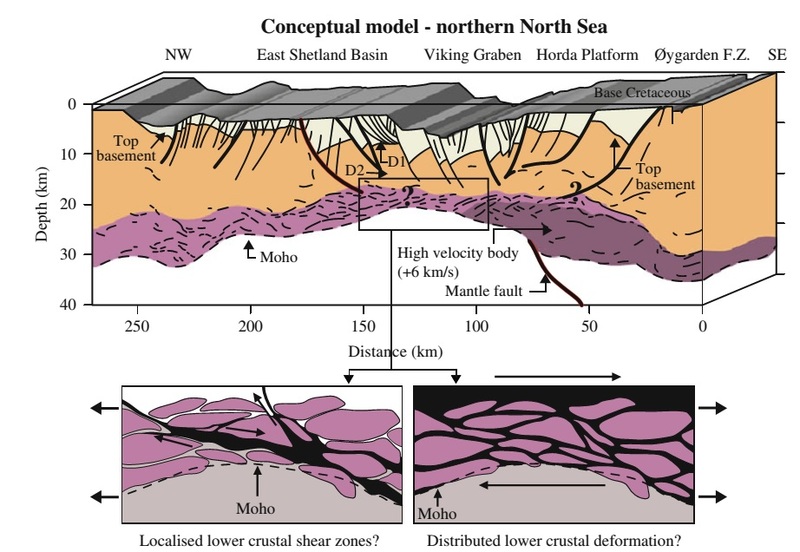 However, if one looks more closely at the structural conﬁguration at depth, one ﬁnds that the northern North Sea basin system, which includes the Viking Graben that developed in Jurassic-Cretaceous times, is underlain by an older (Permo-Triassic) basin system. The Permo-Triassic basin system is in turn superimposed on the even older Caledonian suture, which was subsequently affected by gravitational collapse in Devonian times, representing the last stage in a previous Wilson Cycle. 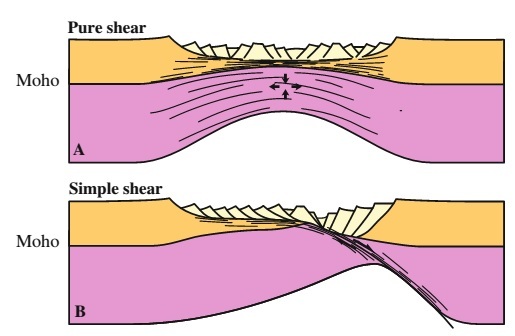 Basic conﬁguration of (a) pure shear and (b) simple shear extensional basins. There are several models for the lithospheric conﬁgurations that accompany extensional crustal thinning, the end members of which are the "pure shear" (symmetrical) and "simple shear" (asymmetrical) models. It should be noticed that these models are not necessarily mutually exclusive; we can ﬁnd basin systems that display elements from more than one model, such as the "delamination model". The "pure-shear model" for extensional crustal thinning has become the most frequently cited in geosciences in modern times. This model assumes thinning of the weak lower crust/lower lithosphere by pure shear, and hence is characterised by the development of a symmetrical conﬁguration. 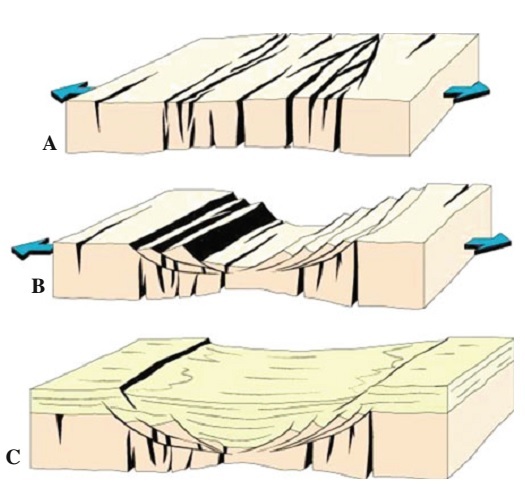 The pure-shear extension of the ductile lower crust is accompanied by thinning of the upper crust by brittle faulting and subsequent development and rotation of fault blocks. good accuracy on the basis of the algorithms which supplied with additional modelling tools, developed particularly in the late 1990s. For modelling purposes and for the analysis of extensional basins with respect to petroleum exploration, three stages of development can be distinguished. Three major stages in the development of extensional. The pre-rift stage is characterised by gentle ﬂexuring and fracturing of the lithosphere. In some rifts we see the development of a gentle bulge, caused by mantle doming and associated warming and hence expansion of the lithosphere. In other cases, a gentle subsidence, deﬁning a broad, shallow basin is seen, caused by mild extension of the cold (not-yet-heated) lithosphere. In both cases, the lithosphere is prone to develop steep fractures on a crustal or even lithospheric scale. These fractures have the capacity to accommodate magma, generating dikes. Regarding hydrocarbon reservoir potential characterising the pre-rift stage, sand deposits are likely to be sheet-like and relatively thin, with few structural traps developing at this stage. Sediment transport is mainly transverse to the basin axis, but quite homogeneous due to lack of pronounced gradients in the basin. The marginal sediment transport system is prone to act in concert with the axial transport system, feeding the latter with sediments. 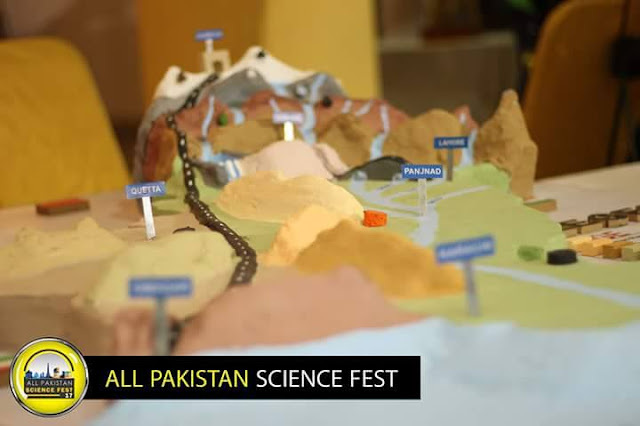 This may consist of braided or meandering river systems, depending on factors like axial basin gradient and climate. Since most rifts are generated by break-up of continents, a terrestrial depositional environment would be most common for the pre-rift stage, so that source rocks and cap rocks, which are mostly of marine depositional origin, may be scarce. There are, however, numerous examples of both source rocks and cap rocks of terrestrial origin. In the active stretching stage extension, and hence also subsidence, accelerate. Simultaneously, heat input increases due to upheaval of hot layers of the mantle lithosphere. The steep fractures generated in the pre-rift stage will not be able to accommodate the extension and a new set of low-angle planar or listric faults will be activated, separating fault blocks that are detached from the lower crust by a sub-horizontal zone of weakness. Gliding on the system of detachments, the fault blocks and their internal beds will rotate away from the basin axis. From the view of the petroleum explorationist, the active stretching stage deserves particular attention because of the variety of structural and stratigraphic traps that may develop. This stage is also characterised by a complex sediment distribution system that is likely to produce a variety of lithofacies due to the increasing topographic relief associated with high fault activity. The marine transgression that commonly follows the increased subsidence of the basin ﬂoor also contributes to this variety in sedimentary facies. Sand that is eroded from the high-standing parts of the basin (basin shoulders and crests of rotated fault blocks) may be trapped in lows in various structural positions and these units are likely later to be covered by transgressive marine sediment accumulations. The sediment transport system in the active stretching stage is likely to be dominated by complex transverse and locally bidirectional ﬂuvial systems that are strongly inﬂuenced by the elongated, rotated fault blocks, generating axis parallel transport in segments along the basin margin. The central part of the basin may be less complex and axial-parallel sediment transport would prevail there. In the thermal subsidence stage, thermal contraction of the lithosphere dominates the basin subsidence pattern. Because solids typically contract during cooling, the parts of the basin that have experienced the strongest extension (those that have been thinned the most and hence heated the most) will contract and subside more than other parts. In a pure-shear conﬁguration this is most likely to be the central segment running along the basin axis. This means that the rotation of strata upwards away from the basin axis becomes reversed so that strata begin to rotate downwards towards the basin axis. This rotation is strengthened by sediment loading and compaction (thickest sequence in the central part of the basin). The transverse sediment transport will persist during the thermal subsidence stage, while the basin ﬂoor becomes gradually smoothed. An axial transport system may also still be active, but is likely to become less pronounced through this stage of development. Depending on the balance between subsidence and sediment input, the water depth will vary from one basin to another, but the depositional environment is likely to be marine and the central part of the basin may attain great water depth (thousands of metres). The fault systems that dominated the basin ﬂoor geometry during the active stretching stage are now quiescent, and stratigraphic hydrocarbon traps rather than structural ones are likely to be the most common. Syn-rift to post-rift transition. The pure-shear model predicts that a simple geometrical change of the outline of extensional basins will accompany the transition from the syn- to the post-rift stage. In this model the margins of the relatively narrow, steep-walled rift, which traps the syn-rift sediments, become overstepped at the syn- to post-rift transition. This implies that the basin becomes wider and the rate of subsidence decreases asymptotically during the following post-rift stage. Thus, one deﬁnes the beginning of the post-rift development as the stage by which the syn-rift faults become inactive and subsidence becomes controlled dominantly by thermal contraction and sediment loading. In practical terms, the identiﬁcation of this stage in the basin development is not trivial, because the transition is frequently not synchronous all over the basin, and the criteria for identifying the transition in reﬂection seismic data are not always well constrained. To overcome this problem, the syn- to post-rift transition should be deﬁned more precisely as the point in time when net heat out of the system is greater than net heat into the system. It is recognised that a lateral heat ﬂow gradient commonly exists perpendicular to the basin axis. This implies that the area closest to the basin axis, which coincides with the area of greatest thinning, is also the part of the basin displaying the highest heat ﬂux at the end of the syn-rift stage. The lithosphere beneath the central part of the basin will accordingly undergo the greatest vertical contraction during the post-rift stage. The enhanced subsidence at the basin axis is further enhanced in cases where the basin is ﬁlled by sediments, creating an extra load and also a greater total compaction. Hence, the syn-topost rift transition coincides with a regional shift in tilt from fault block rotation away from the graben axis during the syn-rift stage to tilting directed towards the basin axis during the post-rift development. This change is due to a shift from bulk thermal expansion to bulk thermal contraction of the lithosphere and is in most cases clearly distinguishable in reﬂection seismic data. It needs to be emphasised that the syn- to post-rift transition is unlikely to occur simultaneously throughout the entire basin. This is due to differences in structural conﬁgurations, e.g. the existence of graben units, and thermal inhomogeneities associated with variable stretching both along and transverse to the basin axis. The entire Cretaceous sequence of the northern North Sea is included in the post-rift development sensu stricto. Furthermore, analysis of the basin topography permits three sub-stages to be identiﬁed within the framework of the post-rift development: the incipient, the middle and the mature post-rift stages. The conﬁguration at the syn-rift/post-rift transition is treated separately in the present analysis. In the analysis of basin subsidence it is important to remember that in addition to the effects of fault-related subsidence and thermal expansion and contraction, the basin’s subsidence is affected by elastic deformation and isostasy, and in many cases also by extra-basinal stress. The simple-shear model for extensional basins is in considerable geometrical and mechanical contrast to the pure-shear model for extensional basins in that the simple-shear model assumes that extension is concentrated along one or several inclined fault zone(s) affecting the entire crust. Still, when thermo-tectonic and isostatic responses are concerned the principles are similar to those of the pure-shear model. The simple-shear model is based on observations in the Basin-and-Range of North America. The Basin and Range basin system displays a particular geometry in that the lithosphere is extended to the degree that the lower crust, described as a metamorphic core complex, has become uplifted and exposed in the central part of the basin. The asymmetrical conﬁguration of the basin particularly inﬂuences the pattern of isostatic response to extension. An important factor is the relative thickness of the upper mantle/lithosphere. This is because the lower crust commonly is denser than the upper astenosphere, causing large-scale contrasts in differential subsidence and uplift across the basin. Superimposed on this are more local isostatic effects, associated with contrasting thicknesses of layers with different densities and the topography of the basin. Since the same tectono-thermal principles that apply for the pure shear basinal so are valid for simple shear basins, the main basin stages and the conditions for hydrocarbon generation and entrapment are also the same. Even though the simple-shear model was inspired by analysis of the Basin-and-Range basin system it has proved relevant for many other basins too, suggesting that simple shear is a common component in the formation of basins. Model of the Viking Graben, displaying elements of pure and simple shear. The delamination model can be seen as a combination of the simple- and pure-shear models. In this case the upper and middle crust extends by simple shear. At depth, the master fault ﬂattens and merges with the lower crust, which becomes thinned by pure shear. TheViking Graben of the northern North Sea seems to have a conﬁguration that ﬁts the delamination model. Also in this case, the thermo mechanical pure-shear model applies and, with some modiﬁcations, can be used to model the basin development. However, the delamination model makes it necessary to take into account an additional variable parameter, namely that the two parts of the lithosphere situated above and beneath the delamination surface have undergone different amounts of extension. The concept of plate tectonics offers a useful framework for structural geological analysis on all relevant scales in petroleum geology, from regional in the exploration stage, to local in the reservoir evaluation and production stages. This is natural, because the principal geological stress systems are ruled by processes in the deep earth like mantle convection and lithosphere subduction, the secondary effects of which are manifested at the base of the lithosphere and along plate margins. Based on these concepts, the basic dynamics of the lithosphere can be quantiﬁed, which is a prerequisite for the evaluation and calculation of the state of stress at any point. As seen in the perspective of the petroleum structural geologist, understanding and quantifying the stress situation at the plate margins is a prerequisite for understanding the state of stress in any basin system and in any reservoir. We term principal stresses originated at plate margins far-ﬁeld or contemporary stresses. The stress situation in a basin or a reservoir may be a sum of several far-ﬁeld stresses combined with a local stress, which may be related to burial, erosion, geothermal gradients, topography, basement relief and structural inhomogeneities in the substratum. In other words, the plate tectonic framework provides a basic and general concept on which any structural geological analysis of a sedimentary basin rests, but it must be supplied with information on the local stress system that is superimposed on it. In the context of the far-ﬁeld plate tectonic stress, we distinguish between the plate boundary and the intra-plate component. The plate boundary stress is subdivided into three basic plate margin settings, namely constructive boundaries where adjoining plates are moving away from each other and new crust is formed by magmatic activity, destructive boundaries where lithosphere is consumed by subduction or obduction, and conservative boundaries where plates are moving past each other in a strike-slip sense and where lithosphere is neither created nor consumed. It is important to note that plate boundaries have been generated and destroyed throughout large parts of the history of our planet, so that many may be preserved inside the present plates and hence do not coincide with present continent/ocean margins.The three basic types of plate margin coincide with the three principal stress conﬁgurations, namely the tensional, the compressional and the strike-slip regimes. To describe these regimes, we rely on the concept of principal stress conﬁgurations and their deﬁnition in the context of the principal axes of stress. Tectonic stress = contemporary stress + local stress. σH = [υ/1− υ] ρgz + σt where υ is Young’s modulus. Because (υ/1− υ) < 0, the tectonic stress is σt > σ*t . Accordingly, the reference stress condition selected also inﬂuences the calculated total tectonic stress as long as the buried rock is compressive. For a non-compressive rock (υ =0.5), lithostatic and uni-axial reference systems are equal. Our daily contact with the physical world tells us that materials deform in many ways, depending on the type of material and its physical state. Thus, a liquid reacts to outer stress very differently from a piece of rock, and one type of rock like chalk has very different physical properties as compared to another like granite. Furthermore, one material may change its mechanical properties dramatically by change of temperature and pressure. These contrasts are founded on processes occurring on the scales of the grains (in a rock), the molecule and the atom. These processes and their associated meso- and macroscopic physical expressions names like brittle, elastic, plastic, viscous and ductile, and sometimes combinations like elastico-plastic. Unfortunately, these terms are not always used in a consequent manner and are therefore liable to cause confusion when taken out of context or not precisely deﬁned. This particularly concerns the term "brittle", because it is used in a double sense, namely as a deformation mechanism and a deformation style. When applied in the context of deformation mechanisms, brittle deformation implies that existing bonds are physically broken between mineral grains, or that fracturing of the individual grains themselves takes place. As a consequence, the rock loses its cohesion and (potentially) physically falls apart. In contrast, the plastic deformation mechanism implies that deformation takes place by the transfer of dislocations on the atomic scale. This means that the mineral can change its shape without loss of cohesion. Generally, plastic deformation occurs at higher p,T-conditions than those accompanying brittle deformation. Concerning deformation style, the term brittle is used about localised strain, like that associated with jointing and faulting, and particularly in cases when the rock loses its cohesion and where the deformation occurs at lower p,T-conditions (though not necessarily so). The ductile deformation style characterises strain which is distributed over a wider area, as commonly observed in connection with folding and meso- and mega-scale shear-zones. A ductile style of deformation is predominant at high p,T-conditions, but may also occur under very low p,T-conditions, if it involves weak materials like sand and clay. In such cases, however, displacement takes place along grain boundaries or along borders between rock bodies and not by dislocation creep or other atomic-scale mechanisms that characterise the plastic deformation mechanism. 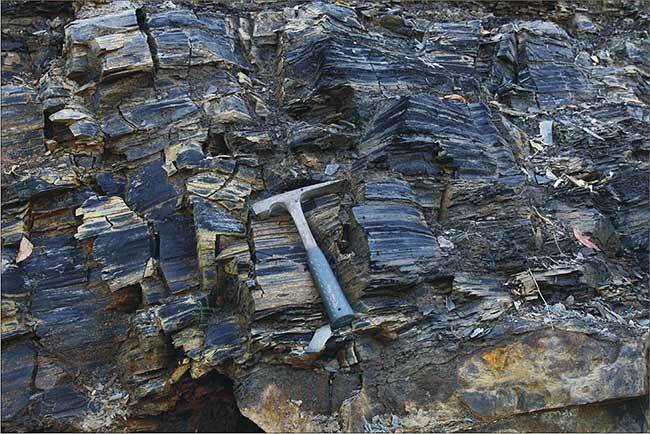 Oil shales are source rocks, usually mudstones and shales, with a high organic content (TOC), which have not been buried deeply enough to become sufﬁciently mature for most of the hydrocarbons to be generated. Although they may contain some hydrocarbons they must be heated in an oven (pyrolysis) to 400–500◦C so that most of the petroleum can be generated from the remaining kerogen. Oil shales must therefore be mined near the surface in quarries and then heated in large ovens so that the petroleum can be distilled off. 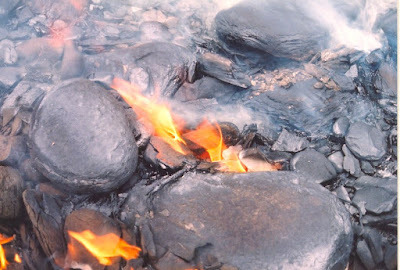 Source rocks may be uplifted close to the surface after deeper burial; it is the temperature history that determines how much of the kerogen is altered to oil and gas. Some source rocks may have been buried to more than 5–6 km (160–170◦C) and they have then generated and expelled most of the hydrocarbons, but some oil and particularly gas may remain. The Upper Cambrian alum shale which is found in the Oslo region is a good example of a rich source rock which has been buried to at least 200◦C (5– 7 km) and lost most of its hydrocarbons during the Caledonian folding in the late Silurian and early Devonian. In Sweden the Upper Cambrian alum shales have not been buried so deeply and therefore contain more oil which can be distilled off by pyrolysis at 400–500◦C. In the Baltic region the lowermost Ordovician shales are even less mature so that more of the kerogen remains and in Estonia this shale is mined for oil on a large scale. Here the reserves are very large (0.6×109 sm3 oil equivalents [o.e.]). Oil shales are used in electric power generation and provide 60% of Estonia’s stationary energy. It is also used for oil production and reﬁning. The waste is 70– 80 Mt. of semi-coke and the mounds exceed 100 m in height. The waste is very ﬁne grained and is alkaline with signiﬁcant concentrations of sulphides and heavy metals. On a global basis oil shales represent a reserve almost as large as conventional oil. Conservative estimates: 350 Gt shale oil equivalent to 2.6×109 barrels of oil (410×109 sm3 o.e.). This is about equivalent to the estimated world reserves of conventional oil and gas (480 sm3 o.e.). More than 80% of the well known reserves are located in the US but there are probably other regions with oil shales which have not been recorded and evaluated. The Green River Shale in Colorado, Utah and Wyoming is a gigantic source of hydrocarbons. This organic-rich mudstone was deposited in very large lakes during the Eocene and the organic matter was mostly freshwater algae. Oil shales must however be mined and heated in ovens (pyrolysis) to generate the petroleum and the energy for the heating is taken from the burning of the oil shales. The release of CO2 is therefore high also during production. Oil shales may only contain 5–10% organic matter and the volume of waste will then be 10–20 times the oil produced. The waste consists of coke and also smectite formed in the heating process and is very difﬁcult to store. It is also rich in heavy metals, including vanadium and uranium which are typical of black shales. Production of oil from oil shales requires very large amounts of water, so in dry areas the water supply may be a limiting factor. There are therefore considerable environmental problems linked to the exploitation of oil shales as a major source of oil. Some source rocks may have enough permeability to serve as reservoir rocks too. The Miocene Monterey Formation in California is an organic-rich diatomaceous source rock, which is also a reservoir rock. Oil can in this case be produced because of tectonic fracturing which has enhanced the permeability. Source rocks may also be interbedded with thin sandstones or limestones and then only a very short migration is required. Organic-rich shales which have been buried to depths where most of the oil and gas has been generated and expelled may nevertheless contain considerable amounts of gas. The gas remaining in these shales is present in very small pores and may also be partly adsorbed on remaining organic matter or its residue (coke) and on clay minerals. The shales have been uplifted and may therefore have small extensional fractures, but they must be hydrofractured by water injection to increase the permeability. Barnett Shale is tight shale of Mississippian age in Texas, containing at least 2.5 trillion cubic feet of gas. It is referred to as a tight gas reservoir. Much of the gas is in urban areas such as the Dallas-Forth Worth area. The permeability of the shale matrix is generally very low but there may be thin silty layers and also fractures that increase the effective permeability. Hydraulic fracturing can be carried out to further increase the permeability, and horizontal drilling also helps to produce more gas. The Woodford Shale (Devonian) in Oklahoma can be almost 100 m thick. Devonian tight gas shales include the Middle Devonian Marcellus Shales in the Appalachians.These are now mostly at 1–2 km depth but have previously been buried much deeper (5–6 km or more). The Upper Devonian Bakken Shale is another major producer, particularly in North Dakota, and is part of the Williston Basin. It also extends into Canada. Shale gas is estimated to produce 50% of the gas in North America by 2020. Higher gas prices will also result in increased interest in shale gas in other parts of the world. Shale gas represents very large reserves of hydrocarbons which can be used directly as gas, but can also be converted to diesel fuels for cars and trucks. This gas can also be mixed with heavy oil and tar sand to make regular petrol. Production of gas from shales requires much water for fracturing and produced water may also create environmental problems. Flow in fractures produced by hydro-fracturing due to overpressure (mostly microfractures). Flow in tectonically induced macrofractures. In the case of matrix-controlled ﬂow the capillary entry pressure and the permeability are a function of the pore size distribution and diagenetic alterations. In shales the typical pore sizes may be a few 100 Å or less. In the Gulf Coast the pore diameter may be less than 25 Å at 3–4 km depth and less than 10 Å at 4–5 km burial. The size of the largest pores and their connections will however determine the permeability. It the largest connecting pore size is below 50 Å this is approaching the size of the asphaltenes in crude oil. A sieving effect should therefore be observed relative to the size of the organic molecules if the pore throats are below this value. Migration of oil through low permeability shales probably only happens along fractures and not through the shale matrix. Fractures in shales may be formed tectonically during uplift and extension when the shales are brittle. Relatively large fractures may occur because the horizontal stresses trying to close the fractures are generally small. This is a common cause of oil and gas leakage from reservoirs. However, nearly all on shore reservoir sand many offshore reservoirs have experienced some uplift from their maximum burial depth and in a rock mechanical sense are therefore over consolidated and will tend to be brittle. During basin subsidence, tectonic shear produces fractures during ductile deformation and these fractures are then no more permeable than the matrix. Oilﬁelds are often highly over pressured, with many of them leaking petroleum at the top of the structure which is often close to the fracture pressure. This means that it is the horizontal stress and the tensional strength of the rocks that control the pressure. When the pressure is close to fracture pressure it implies that faults are no longer the conduits for ﬂuid ﬂow because the rock matrix would then fracture and let the oil through. If faults were a zone of weakness the ﬂuid pressure should have remained below fracture pressure. In the case of traps formed by rotated fault blocks the top of the structure will usually coincide with a fault. Even if seismic evidence indicates gas leakage from the top of the reservoir, this does not necessarily mean that the leakage is along the fault, because fracturing of the cap rock will occur in approximately the same position. We must distinguish clearly between migration of oil along a fault plane and across it. If there is sand on both sides of the fault plane it is difﬁcult to predict if the fault will be a barrier for oil migration. 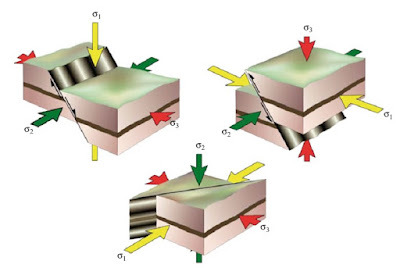 Sealing faults are often critical for the formation of traps in rotated fault blocks. Clay smears from adjacent shales can serve as a barrier at shallow depth, while at greater depth intensive quartz cementation may reduce the permeability and the capillary entry pressure for oil. In subsiding basins, fault planes are at shallow to moderate burial depth and are subjected to shear deformation which produces clay smearing, so that the permeability along the fault is normally lower than through the rock matrix. 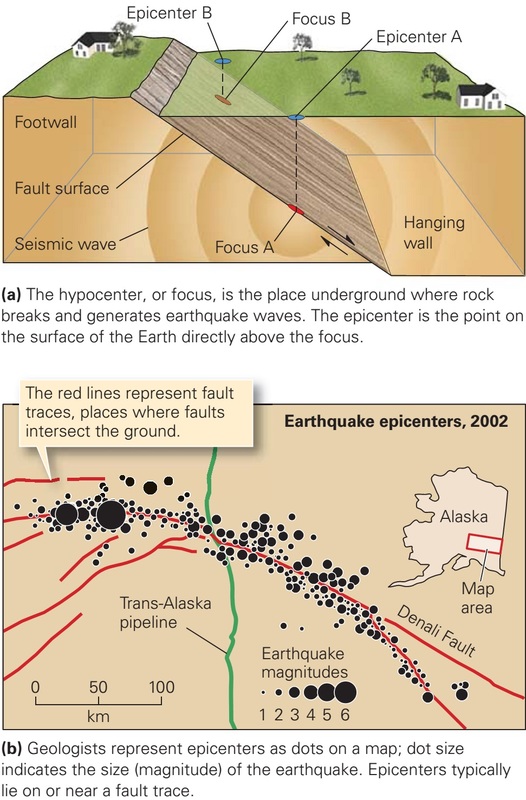 After tectonic displacement, faults may also be subject to cementation. During tectonic uplift, however, faults may be extensional and much more permeable. Migration due to hydrofracturing of shales. If the ﬂuid pressure exceeds the fracture pressure the rock will hydrofracture. The pressure required to fracture the rock can be measured in a well by using a leak-off test. However, the LOT creates micro-fractures which develop at a lower pressure than that required to form proper fracturing. These micro-fractures should theoretically develop when the pressure exceeds the sum of the least horizontal stress and the tensional strength of the rock. Since the pressure required for large scale fractures to form (fracture pressure) is higher than the LOT test value, the tensional strength which allows micro-fractures to form is lower than when forming proper hydrofracturing. In the case of micro-fractures (LOT tests) these probably deform the rock in a different way, so that the rock can heal once the pressure is released. Fractures developed by hydrofracturing during leakage of oil are likely to be vertical because they develop parallel to the direction of maximum stress which is normally vertical in subsiding basins with little external tectonic stress. As a fracture opens, the permeability along it is increased. This reduces the pressure gradient along the fault plane to less than the fracture gradient. The top of the fracture may therefore be above fracture pressure, while the lowest part is below fracture pressure and subject to effective stress trying to close it. The fractures produced by hydrofracturing must therefore propagate upwards and are of limited vertical extent. They develop ﬁrst in the least permeable parts of the shale (cap rock) which may only contain water because of low capillary entry pressure. The pressure in these very small water-saturated pores should not be inﬂuenced by the pressure in the petroleum phase in the sandstones. The excess pressure in the petroleum phase compared to the water pressure, is held by the capillary forces and does not inﬂuence the pressure causing onset of hydrofracturing. However once the ﬁrst fracturing has occurred the petroleum will be the continuous phase along the fracture, and it is the pressure in the hydrocarbon phase which causes leakage when the horizontal stress is exceeded. In the laboratory, water has been shown to ﬂow though a cap rock while oil has been retained by the capillary pressures. If we consider migration in two dimensions it is clear that it is not only the source rock that will fracture. All the overlying shales that could serve as potential cap rocks could reach fracture pressure and leak petroleum if there are no lateral drainage paths. This is because the fracture pressure gradient is steeper than the ﬂuid pressure gradient. Accumulation of petroleum in a trap capped by shale which does not fracture, requires that the pressure be reduced by lateral ﬂow of water to maintain pressure below fracture pressure. Although the classiﬁcations based on the form, type and genesis of oil and gas accumulations are called the ‘‘hydrocarbon accumulation classiﬁcations’’ they are in effect the trap classiﬁcations. These trap classiﬁcations may be grouped into three major types and four subtypes. Accumulations formed as a result of folding are usually associated with the bedded reservoirs. The complexity of structure (sometimes even isometric), size, and especially height are caused by the trap and reservoir position in the sedimentary basin. Over the central areas of tectonic plates, the traps are gentle and sometimes very large. Over the plate margins, transition zones and, especially, collision zones the folds are higher, steeper and with a clearly expressed trend. The accumulations may be classiﬁed using some other parameters (mentioned earlier), too. In particular, oil–water contours in such accumulations are closed and, in plan view, have oval or more intricate shapes, and form rings. Accumulations formed within various buildups are usually associated with the massive-type reservoirs. Most common are accumulations in biogenic buildups (reefs and bioherms). Sometimes, biostromes are mistakenly attributed to the same class. Included here are large accumulations with huge ﬂow rates due to the presence of fractures and vugs in carbonates. Some investigators also include in this group the erosional projections of the metamorphic and volcanic rocks (fault-bounded or bounded by erosional surfaces), which may contain accumulations, e.g., White Tiger Field in Vietnam. Lithologic and stratigraphic traps include facies pinch-outs, stratigraphic unconformities, and contact of the reservoir with the impermeable rock upsection. Such traps may be associated with the bedded reservoirs on the monoclines or on the ﬂanks of anticlines. These traps may contain rather large accumulations. They may be associated with bedded reservoirs conﬁned on every side. In such a case, they form large accumulations. Water saturation contours impinge on the trap (impermeable barrier). This type of accumulations is very common: about 50% of all known accumulations. Accumulations of Types I, II, and III are formed in accordance with the gravitational (anticlinal) theory. By far, not all known accumulations, however, belong in the described three types or combinations thereof. Also, not all of them formed in accordance with the gravitational theory. Oil or gas found in hydrophilic rocks occupy coarser-grained reservoir rocks, which are sealed by water-saturated ﬁne-grained reservoir rocks. Examples of such accumulations associated with the relatively coarse-grained sandstone lenses example: The 100-ft sandstone in Appalachian oil and gas province, USA. Although the appearance of capillary forces is frequently observed, the formation and preservation of the accumulations cannot be attributed to these forces. It should be kept in mind that water and gas lenses exist within oil accumulations; water is sometimes encountered up-dip in pinched-out reservoirs exmaple: Productive Series of the Absheron Peninsula in Azerbaijan, and Maykopian sandstones in the Northwest Caucasus. The hydraulic forces can cause a tilt in the oil–water interface. A barrier (facies change, stratigraphic unconformity, and fault) often turns out to be a barrier due to the presence of pressure difference across it, rather than because of the appearance of an impermeable barrier in the way of ﬂuid movement. The necessary condition for the preservation of hydraulically trapped accumulation next to a fault is a higher potential head of the water next to the fault zone than that of the productive formation (the surplus pressure is included). This condition may exist if, for instance, there is a communication along the fault between the accumulation and the reservoir with overpressure. In monoclines, the accumulations can be preserved if the potential head decreases down-dip in locations where the dip increases or the dip of the piezometric surface decreases. The latter is possible when the reservoir–rock properties change (capillary forces enter into play). 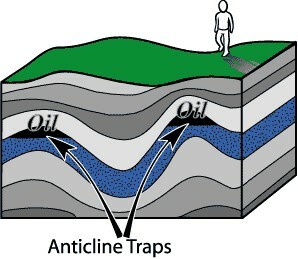 The oil–water contact can close onto themselves (but crossing the structural contour lines on the top of the reservoir) or can about the trapping barrier. Neither of the described types, however, owes its existence to the hydraulic forces exclusively. Hydraulic, capillary and gravity forces. The effect of hydraulic forces is commensurate with that of gravity and capillary forces. Gas accumulations in synclines or in monoclines devoid of structural highs. There is a gas accumulation in the Deep Basin monocline in Alberta, Canada. The latter accumulation resides in the Mesozoic sandstone, which is more than 3km high (the thickness of individual gas intervals is 10–150 m). The sandstone is water-saturated up-dip the gas accumulation, with an improvement in petrophysical properties. The gas reserves here are nearly 11.3 TCM. The gas accumulation of Milk River Field (Canada), with 250 BCM of reserves, is another similar example. The gas accumulation of San Juan Field (USA) resides in the Mesozoic sandstone in the synclinal part of the structure, with reserves of 700 BCM. The sandstone is water-saturated over the ﬂanks. The porosity and permeability within the gas-saturated portion are 14% and 1 mD, respectively, whereas in the water-saturated portion, f ¼ 25% and k ¼ 100 mD. A rapid gas generation is currently occurring in the Mesozoic sandstones of the Milk River and San Juan ﬁelds at a temperature of 85–921 C. This gas is entering the reservoir at a higher rate that it is being removed from the reservoir. The reservoir rocks are hydrophobic. Capillary forces move the gas into the reservoir with ﬁner pores and keep it there. In the case of the ﬁrst explanation above, if the gas-saturated reservoirs are intercommunicated and form a single accumulation, the surplus pressure in its upper portion should be around 30 MPa. If f ¼ 25% and k ¼ 100 mD, the effect of capillary forces would be negligible and insufﬁcient for retaining the accumulation. Also, if the porosity and permeability values are low along the axis of syncline, a high rate of gas input would be doubtful. The two explanations above assume that the gas is retained due to the change in rock properties. In the ﬁrst explanation the fast gas input from clays is assumed (and from a larger area than the gas escape area). The second explanation subscribes to the action of capillary forces in hydrophobic rocks. It is quite possible, however, that the ﬂuid properties change together with the changes in the reservoir–rock properties. A prolific gas generation occurred (and may still be occurring) in the Mesozoic sequence. The gas dissolves in water as soon as it is formed. Thus, the gas-saturated water enters the reservoir. In this case, the surplus pressure within the upper portion of the accumulation would be tens of times lower than that for the gas accumulations. Up-dip, the pore size increases (as indicated by the higher porosity and permeability), the capillary pressure and temperature decline, gas solubility in water drastically decreases (depending on changes in the reservoir conditions), and gas is released as a free phase forming a gas-in-water emulsion. A substantial portion of the released gas energy is spent for the formation of emulsion. The emulsion has huge surface area and, correspondingly, huge surface energy. Thus, the gas accumulation is insulated by the gas-in-water emulsion, which is only slightly movable and is elastic at reservoir conditions. Changes in the ﬂuid properties due to changes in the formation temperature and pressure. The existing exploration, testing and production techniques are attuned almost exclusively to the accumulations where the gravity forces predominate. Discoveries of Type VI accumulations in such conditions is highly accidental. Their exploration, testing and production techniques must be established after the known accumulations of this type are studied in detail. Oil and gas ﬁll the pores, vugs, and fractures in reservoir rocks. Usually, not the entire reservoir but only its part called "trap" is ﬁlled with petroleum. There are numerous classiﬁcations of traps depending on their relationships with the reservoir, lithology, rock origin, tectonics, trap size and shape, and the type of energy distribution. Criterion of usefulness of a classiﬁcation or a definition is its applicability. Particular purpose, limited in scope, gives rise to incomplete classiﬁcations. The development of a natural classiﬁcation for the traps and/or reservoirs is very difﬁcult, ﬁrst of all, due to the lack of knowledge about the formation of hydrocarbon accumulations at high pressures and temperatures. Trap is a part of the reservoir where oil and gas can accumulate. Where relative equilibrium of movable components is maintained by the gravity. Where the potential of oil and gas locally reaches a minimum. Which is limited by a closed equipotential surface. With increasing temperature and pressure, the effect of gravity on the ﬂuid distribution decreases. The existing trap classiﬁcations can be divided into three groups. The ﬁrst and the most common classiﬁcation group is called the "Oil and gas classiﬁcations". Yet, their is no stress on the parameters (characteristics) of the accumulations but instead of the crustal elements in which they are housed, i.e., traps (their genesis, structure, shape, and type of reservoir). The second classiﬁcation group associate the trap shape with the conditions of its formation: folds, faults, stratigraphic unconformities, lithological barriers, and combinations of the above. Finally, the third group of classiﬁcations stressed the hydrodynamic head. Type of the reservoir it is associated with (including the lithology). Shape, lateral extent, and height in relation with the positions of possible hydrocarbon cross-ﬂows. Type of the barrier restricting the migration, which at the same time deﬁnes the accumulation boundaries. Any trap classiﬁcation reﬂecting these conditions can be considered practical. The accumulation of hydrocarbons, ﬁlling the trap, is an elementary accumulation of hydrocarbons, the major parameters of which are their quality and quantity and the accumulated energy. Besides, additional parameters must provide necessary information for a successful appraisal and subsequent development of the accumulation. Such parameters include the degree to which the traps are ﬁlled and the nature of the gas–oil–water contacts. The former depends on the environment of trap formation and the tectonic evolution of the basin. In many cases, certain patterns in the degree to which the traps are ﬁlled can be identiﬁed in a basin for a particular stratigraphic interval. This may be successfully used in exploration and estimation of resources of a particular stratigraphic sequence. The locations of the gas–oil–water contacts are important during the exploration and development phases. The knowledge of the tilt of oil–water contact, if present, may prevent drilling of unnecessary wells. The task gets more complicated if there are no definite contacts, replaced by transitional zones. Besides, the contour must be closed (also against a barrier). If the amount of hydrocarbons in an accumulation is sufﬁcient to conduct production, the accumulation is called commercial. This concept is uncertain and depends on many factors, such as the geographic location, available infrastructure, depth, quality of hydrocarbons, and the presence of beneﬁcial or harmful admixtures. In the US greater effort is devoted to the development of small accumulations than in Russia. A more advanced oil and gas-producing equipment in the US enables to produce economically from the smaller accumulations. Smaller accumulations are neglected in Russia, and only larger accumulations are developed because of economics and lower demand of oil than in US. The classiﬁcation of the accumulations by the average rate of production is also quantitative. The class boundaries are tentative and may be changed to ﬁt a specific situation for a particular petroliferous province. It is important to keep in mind the fact that the ﬂow rates reﬂect not only the natural conditions of the accumulation (lithology, ﬂuid properties, energy of accumulation, etc. ), but also the technology (development techniques, well facilities, etc.). Besides, the boundary between the low-rate and non-commercial classes is determined by the economical–technical reasons. The price of the oil and gas determines the position of such boundary, and the political situation (e.g., embargo) may impose the development of even very small accumulations. Organic matter is accumulated (mostly in a dispersed state) in predominantly clayey marine deposits. There are two major types of organic matter: humic and sapropelic. It was believed that the latter played a major role in oil generation, whereas the decomposition of humic organic matter resulted in the formation of coal and water-soluble (hence, easily dispersible) substances and gas. The decomposition of sapropelic matter gives rise to the liquid and gaseous compounds including hydrocarbons. The decomposition occurs as a result of heat ﬂow and the energy of the sun accumulated by the organic matter. The hydrocarbons and some other substances formed from the decomposed organic matter are squeezed together with water out of the shales into the reservoir rocks. The hydrocarbons derived from the organic matter ﬂoat in the water medium (gravitational theory) and move until trapped in the reservoir. Marine origin of oil source rocks appeared to be obvious, although it is unclear why the ﬁrst oil-bearing sequences developed in different countries were continental or near-shore marine Paleogene and Neogene rocks. The studies of the present-day sedimentation indicated that all marine and almost all continental deposits contain organic matter. It was eventually recognized that only the presence of subaquatic sediments, either of marine or continental origin, was required. 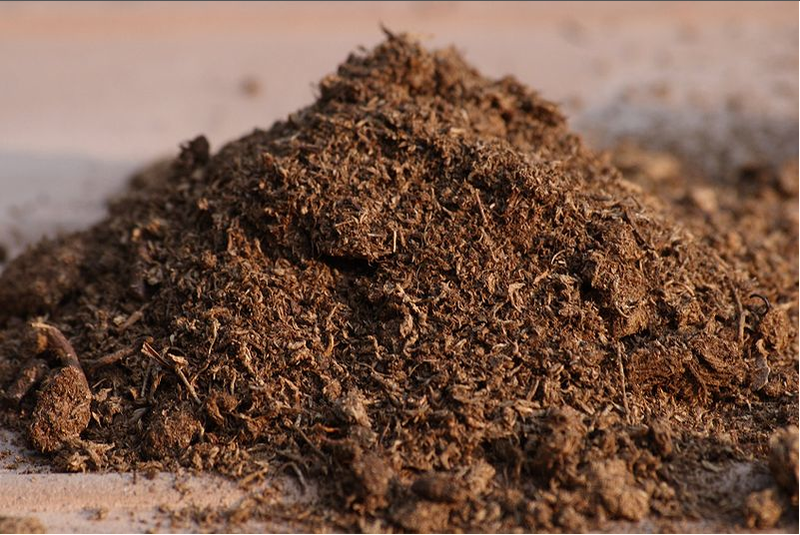 There were three ways for organic matter to "burn" in nature: combustion, smoldering, and rotting. The latter process was believed to be responsible for the organic matter formation in nature. This is an important issue for at least two reasons: rotting occurs without the supply of oxygen; from the outset, the process is believed to be isothermal. Black shales are source rock, black colour is because of the baked organic matter. Sediments may be classiﬁed as source rocks if they contain organic matter at least 2% or 43kg/m3. The absolute amount of organic matter buried in various genetic types of sediments depends on many factors, but mainly on the biological productivity of source organisms and by the facies environment during burial. Relative organic matter concentration also depends on the depositional speed. For example, due to a very slow rate of deposition, organic matter content in the Central Polar Basin reaches 1%. Generally, organic matter concentration in sediments widely ranges between trace amounts and 100% (in peat). The content of a dispersed organic matter in source rocks may be even lower, because part of it had been spent to generate oil and gas that have been expelled. Some other investigators believe that less than 1% of organic matter is converted into oil; thus, the expulsion loss could not significantly affect the residual carbon distribution in sediments. Effect of depositional rate on the qualitative and quantitative outcome of the organic matter transformation. First, the relative increase in the organic matter concentration is observed. Then, the rate reaches 50–200tons/km2/year and the depositional rate decreases due to the organic matter dilution by minerals. Other conditions being equal, the value and duration of AHFP also directly correlates with the depositional rate. The depositional rate in most known oil and gas basins is between 150 and 1000tons/km2/year. The major geologic factor in transforming organic matter into bitumen is the compaction of rocks under the overburden pressure. The oil and gas generation process is lengthy and continuous: Hydrocarbon compounds arise as a result of competition between two opposite trends: when subsidence prevails over uplift, during small as well as large oscillations of a given Earth's crust area. Oscillations of the Earth’s crust are the cause of relationships among the depositional processes, rock formation, and structural development. Sedimentation is responsible for the accumulation of organic matter in deposits. Lithiﬁcation is responsible for the organic matter transformation, whereas the structural development (tectonic activity) is responsible for the formation of combustible fossil fuel accumulations, their metamorphism, and destruction. Oil and gas generation is, therefore, an unalienable part of the Earth’s crust evolution and involves dynamic processes. It is not just a simple mechanical displacement but consists mainly of complex transformations. These transformations consist of biologic, geochemical, physiochemical, and other changes. They manifest themselves jointly, but play different roles at different stages of oil and gas generation. On the basis of laboratory studies, emerged a concept of clay-mineral transformation from montmorillonite to kaolinite during rock compaction. The limitations imposed on the role of clay minerals, as just catalysts in the transformations of organic matter. This concept, in turn, has been questioned, such a process could not proceed in nature due to insufﬁcient supply of potassium in rocks. A number of people recorded the clay-mineral alterations during catagenesis. As an example, montmorillonite alterations during meso-catagenetic (MC) stage and cessation of this process upon reaching the MC4 sub-stage. In the process of alterations, the particles (sheets) change their orientation, which results in locking-up or opening of pores; hence, the ﬁltration in clays acquires a random, unstable nature. What is the nature of source rocks and where and how are they distributed in sedimentary basins? What is the physical state of hydrocarbons in source rocks? What forces (and at what stage) cause them to move to the reservoir rocks (primary migration/expulsion)? When and how do hydrocarbons move within the reservoir rocks to form oil and gas accumulations? What is the relation between (a) the oil and gas composition in the accumulations and (b) the environment of hydrocarbon generation and of formation of accumulations? The term "micro-oil" has been introduced: The origin of oil begins with the living matter where the biochemical compounds are born that initiate formation of petroleum hydrocarbons or, to a smaller extent, where these hydrocarbons are born. Upon deposition at the bottom of a basin, and partially forming in the sediments due to the activity of organisms, these hydrocarbons and pre-hydrocarbons form a young micro-oil. Some people did not accept the term micro-oil because while building their bodies, cellular membranes and other cellular structural elements, plant and animal cells and, especially, some bacteria synthesize hydrocarbons. After death of the organisms and inclusion of their remains in the depositional cycle, the hydrocarbons contained in them may be decomposed by the microbial activity. The relative rate of hydrocarbon decomposition is lower than that of the other organic compounds. Thus, under favourable conditions some hydrocarbons may accumulate. The components of oil were not born all at once. It would be better to discuss not the source but the hydrocarbon generation stages that would correspond to the stages of lithogenesis. Various organic compounds formed from the moment of initial deposition, whereas mixtures of liquid hydrocarbons (crude oils) apparently formed during the formation of accumulations in reservoirs. Various components of oil could have formed at different stages of organic matter transformation and at different lithogenetic stages. Thus, a complex chemical system called crude oil formed within reservoirs in the process of the formation of accumulation. That is why the term micro-oil was not accepted but view was hydrocarbons and non-hydrocarbon organic compounds dispersed in rocks are not macro- or micro-oil. Integrated geological and geochemical studies of the modern and ancient sediments provide ever growing body of data, which indicates that each stage of lithogenesis is accompanied by its own characteristic hydrocarbon generation. It should also be remembered that the parent organic matter is also changing simultaneously. A concept of a relation between the hydrocarbon generation and catagenetic stages was broadened into the doctrine of oil and gas generation cycles. As discussed later, the "stage-wise" and "cyclic" nature do not have the same meaning. In discussing the organic matter transformation into crude oil, it is necessary to consider the transformation factors. The major error implicit in most hydrocarbons-to-crude oil transformation concepts is the attribution of an exclusive role to a single factor. This will result in the detachment from the natural environment where all these factors are operative and intertwined. The transposition of laboratory experiments onto the natural environment, without a full account for its multifaceted character, always results in errors. Besides, an active energy inﬂuence on the source organic matter is attributed to each factor. At the same time, no serious consideration was given until recently to the energy facet of the issue, although it is only natural that organic matter in itself has the sufﬁciently high reserves of energy for the subsequent transformations. It was suggested that the living matter accumulate the sun energy, which is subsequently transferred to the organic matter. It appears that this is not accurate. The heat of the Earth itself should not be forgotten. All geologically "live" planets, including the Earth, release much more heat than they receive from the Sun. The processes of life cannot ignore that energy source. One conﬁrmation of the above is the presence of life at great depth in the oceans, where the sunlight does not reach. No doubt, the energy stored in the living organisms or in organic matter is much greater than that in the oil or coal. The processes of transformation of matter with loss of energy are very common in the Earth’s crust. 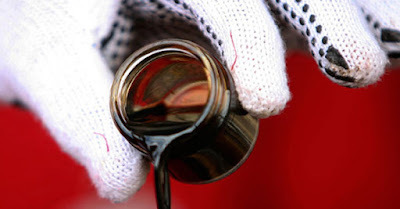 Crude oil is a natural multicomponent mixture. Its major part is composed of hydrocarbons (alkanes, naphthenes, and aromatics). Their content in oils ranges between 30% and 100%. Most important among the non-hydrocarbon components are resins and asphaltenes. The other non-hydrocarbon compounds are metal–porphyrin complexes and trace elements; their content is usually low. Some compounds in oils lost structural features of the parent organic matter, whereas some other molecules preserved these features. They are called ‘‘relic hydrocarbons’’ or ‘‘chemical fossils’’. Alkane hydrocarbons (C5 –C40) include normal and branched molecules (isoprenoids). Carbon number distribution in the normal alkanes reﬂects the composition of the original organic matter. For example, lipids of the continental biomass are dominated by normal C25 –C33 alkanes that consequently are inherited by the oil. The pristane/phytane ratio is used as a genetic criterion for the isoprenoids. The pristane is associated with the continental deposits, whereas the phytane is associated with the marine deposits. Cyclic parafﬁns (naphthenes) include monocyclic (5–6 carbon atoms) as well as polycyclic molecules. The latter molecules may contain 1–6 rings. This feature was probably inherited from the parent organic matter (naphthene index). But most polycyclic naphthenes (such as steranes) were not present in the parent organic matter and have been formed during catagenesis. Arenes (aromatic hydrocarbons) are usually not as important as the other classes of hydrocarbons in crude oils. Aromatic compounds may include exclusively aromatic rings, or may contain complex structures with naphthalene rings. Some arenes are directly related to the parent organic matter. There are cyclic changes in the chemical properties of oils (contents of parafﬁn, asphaltenes, resins, and sulphur) with geologic age of rocks. This cyclicity is controlled by the cyclicity of ocean transgressions and processes of formation and development of paleo-oceans in the geological history of the Earth. Recently developed equipment and techniques drastically increased the information on oil composition. The researchers are now able to determine not only the group hydrocarbon composition, but also the composition of individual hydrocarbons and their structure. The new techniques include gas and liquid chromatography, spectral and isotope methods, and nuclear magnetic and paramagnetic resonances. Among the new highly sensitive equipment are chromatographs, chromato-mass spectrometers, and infrared, ultraviolet, quasi-linear, and isotope spectrometers. A heightened interest in the molecular- and atomic-level information on the oil composition was caused by two factors: technological and geochemical. Petroleum hydrocarbons currently serve as a source of wide spectrum of synthetic substances used for the manufacturing of various goods in food industry and other industries. This required detailed studies of the composition of individual hydrocarbons. The current technology provides an opportunity to obtain information on the detailed composition and structure of hydrocarbons found in the high-boiling oil fractions. Such information covers carbon atom distribution in the parafﬁn chains and in the naphthene and aromatic rings. Lately, this information also became insufﬁcient. Determine the distribution patterns of normal and branched alkanes, methylalkanes, and isoprenoid alkanes in oils. In studying naphthenes, new techniques led to the elucidation of the proportions of mono-, bi-, tri-, and tetracyclic naphthenes, steranes and tri-terpanes (hopanes). Detailed studies of aromatic hydrocarbons in crude oils (using various techniques including spectral) resulted in the establishment of the presence and proportions of not only mono-, bi-, and tricyclic, but also polycyclic (4–6 cycles) hydrocarbons that were almost impossible to identify earlier. The latter include hydrocarbons such as perylene, 1,12-benzoperylene, 3,4-benzopyrene and their homologes. Nuclear-magnetic and paramagnetic resonance techniques developed in the 1950s enabled to study the properties of nuclei in different states. This is important in studying the free radicals (kinetically independent), atoms and atom groups, and chain reactions (polymerization, pyrolysis) in biochemical processes, in which the free radicals actively participate. A new approach in studying the crude oil hydrocarbons involves the stereochemistry of saturated aliphatic and alicyclic hydrocarbons. Stereochemical studies of the normal and branched alkanes and mono-, bi-, tri-, and tetracyclic hydrocarbons (including hopanes) are becoming more important in geochemical studies. It was shown that the transformations (aging) of biomolecules in the Earth’s crust is closely related to the changes in their stereochemistry. There is an increase in the trace element studies. Contents of the trace elements in crude oils vary significantly. 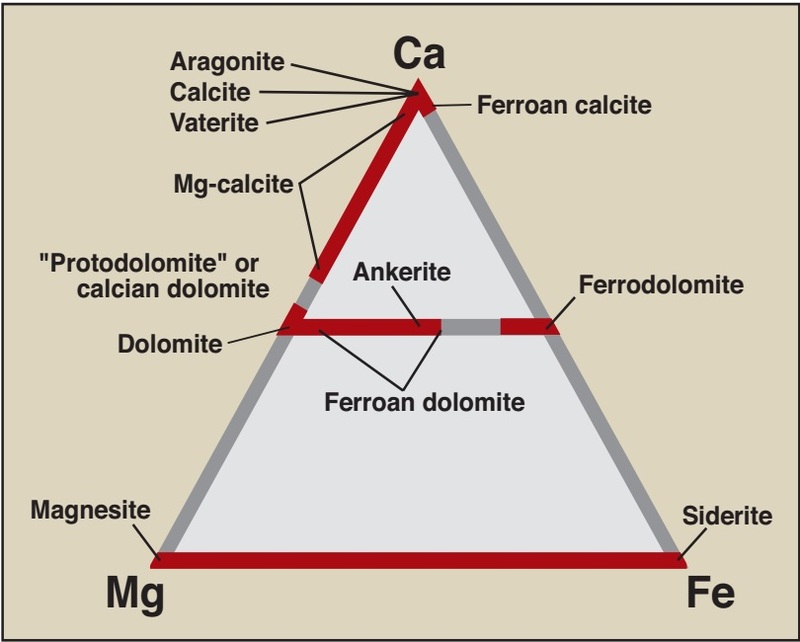 Most of the iron series elements are found in crude oils in amounts below the clarke amounts (sedimentary rock clarke). Some elements (zinc, nickel, copper, arsenic, and silver) are found in near-clarke amounts, and four elements (vanadium, molybdenum, bromine, and mercury) are present in the amounts an order of magnitude above the clarke. This offers an opportunity of their recovery directly from crude oils. The recovery of trace elements from crude oils is technically complex and had not been commonly used, although scientific experimentation is in progress. On the basis of the extensive knowledge of composition and structure for all classes of hydrocarbons, the presence of bio-markers directly related to the parent biomass had been established. Genetic relationship of crude oils and parent organic matter, genetic uniformity (or non-uniformity) of oils in different stratigraphic sequences have been established. Transformations of the specific hydrocarbons within the catagenetic, weathering etc. zones had been elucidated. Forecast the type and composition of hydrocarbon ﬂuids. Identify the potential cross-ﬂow zones. Determine the paths of lateral and vertical migration.